Senegal is a country in West Africa, which surrounds The Gambia on three sides and is bordered on the north by Mauritania, on the east by Mali, and on the south by Guinea and Guinea-Bissau. Dakar is the capital and largest city of Senegal, and it sits on the Cap-Vert peninsula, the westernmost point of Africa. Although Senegal is a majority Muslim country, with more than 90% of the population practicing Islam, the vibe is vibrant and diverse. Culturally, the traditional/religious and the modern/worldly live side by side in relative peace. It’s not uncommon to see men in traditional garb prostrate on the sidewalk to pray, while others dressed in secular clothing pass by. Likewise, one may hear the Muslim Call to Prayer while exiting a nightclub in the early morning. But despite this clash of cultures, one thing seems universal — the Senegalese take great pride in their appearance. The women dress in elaborate, colorful outfits with matching headwraps, even for a trip to the market. The men are earnest about staying in shape and most are tall, lean and muscular. The Senegalese take their reputation for great hospitality just as seriously. They are known for their “teranga”, a Wolof word which characterizes the value of sharing and treating the other as the most important person in the world. If you’re lucky enough to befriend a Senegalese, chances are you’ll be treated to a cultural or culinary treat. This travel guide will help you plan your trip to Senegal so you can experience Teranga firsthand. At only 7 hour and 15 minutes from New York to Dakar, a flight to Senegal is one of the shortest from the United States to the African continent. Delta and South African Airways fly direct to Dakar from the United States. Jet Blue, Emirates, Turkish Airlines, and a host of other airlines offer connecting flights to Dakar. The Léopold Sédar Senghor International Airport is the largest airport in Senegal and is situated near the town of Yoff, north of Dakar. The drive to the city is approximately 20 minutes. Taxis are readily found outside the airport and rates should be negotiated beforehand; fares to most locations in the city should be no more than 3,000 to 5,000 CFAs. Taxis are cheap, safe and everywhere making it easy to explore the city. Senegal no longer requires visas for U.S. citizens for stays of fewer than 90 days. For longer stays, U.S. citizens should obtain visas from the Senegalese Embassy in Washington DC or the Senegalese Consulate in New York. The official currency of Senegal is the West African CFA Franc (CFA), pronounced SAY-fah. CFA notes are available in denominations of 10,000, 5,000 and 1,000 and coins are available in denominations of 500, 200, 100, 50, 25, 10, 5 and 1. At current exchange rates (as of 3/1/2017), 1,000 CFA equal approximately $1.60 USD. Currency can be exchanged in banks and exchange bureaus in Dakar. 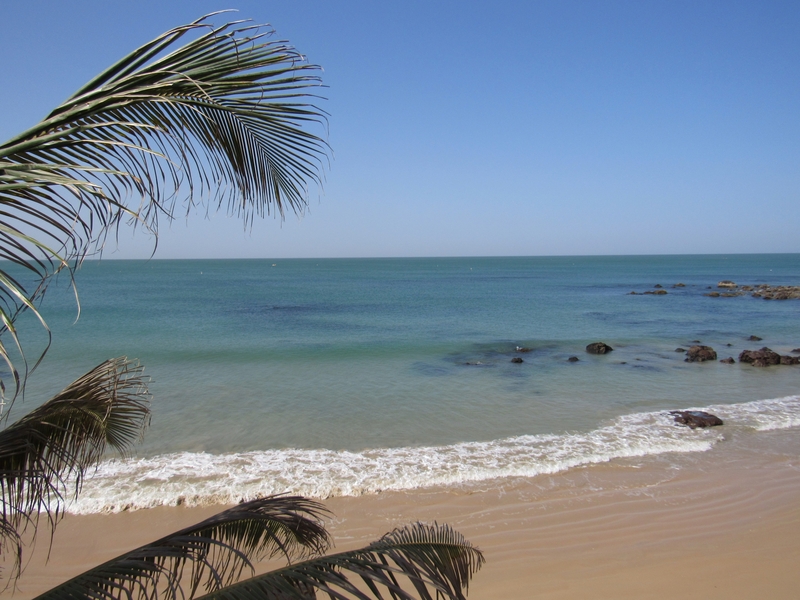 Senegal is mainly a sunny and dry country with well-defined dry and humid seasons. The dry season (December to April) is dominated by hot, dry, harmattan wind and temperatures reach an average of 78 degrees high and 64 degrees low. The rainy season runs from June to October, with August and September being the rainiest months. Temperatures during the rainy season average 86 degrees high and 76 degrees low. Most of Dakar’s Western-style hotels are located either in the downtown area or in the beachfront neighborhoods of Les Almadies and Ngor. Airbnbs and vacation rentals are also lodging options. Senegal is a multilingual country. As a former French colony, French is the official language of Senegal. Wolof is the most widely spoken language, either as a first or second language. Many other native languages are spoken or recognized. English speakers are limited so you would do well to learn a few words of French or Wolof before you arrive. Common greetings include Asalaam Ailaikum (Arabic), Nan ga Def (Wolof), and Bonjour (French). Goree Island is a UNESCO World Heritage site and the location of the House of Slaves, a museum and memorial to the Atlantic slave trade. The House of Slaves is best known for its Door of No Return, meant to memorialize the final exit point of captured slaves before their forced journey to the Americas. The House of Slaves is open daily, except Mondays, from 10:30 am to 6:00 pm. Ferries to the Island can be taken from the terminal north of Place de l’Independance and cost 5,200 CFA for non-residents. The trip takes approximately 20 minutes. Nestled between white sand dunes and the Atlantic Ocean, the Pink Lake is named for its pink waters caused by Dunaliella salina bacteria. It’s known both for its unusual color and its high salt content, which at 40% in some areas, is comparable to the Dead Sea. The pink color is more visible during the dry season (from November to June) and is less visible during the rainy season (July to October). Boat tours of the lake and 4 x 4 tours of the salt dunes are available and prices are negotiable. Be sure to bring your hard bargaining skills because tourist rates are highly inflated. The Pink Lake is located about an hour outside of Dakar. 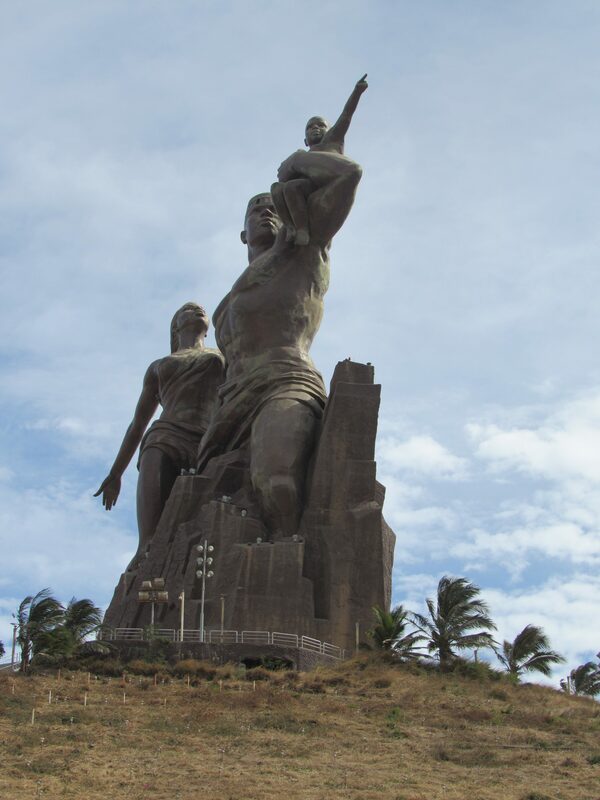 This massive bronze statue sits on top of the twin hills of Collines des Mamelles on the outskirts of Dakar. The monument is a display of African pride, dedicated to the end of slavery and to Africa’s emergence from the European regimes that once ruled the continent. It is the largest statue in Africa. The IFAN Museum is one of the oldest art museums in West Africa and it includes important art collections from across Francophone Africa. It’s one of the regular locations of the Dakar Biennale (“Dak’Art – Biennale de l’Art Africain Contemporain”), a major art exhibition by contemporary African and diaspora artists that takes place every two years. Dakar has a number of traditional African markets — Sandaga, HLM, Kermel and Soumbedioune — that sell seafood, vegetables, fabric, jewelry, leather goods, and artwork. Marché Sandaga is the largest and most hectic with three levels of stalls. Marché HLM is geared towards fabric and is the place to go to buy African wax print. Tailors are also available to custom fit and tailor African fashions. Marché Kermel is located near the city center and has quality artisanal goods and textiles. Marché Soumbedioune is a popular evening fish market. Fresh caught fish and seafood is hauled in between 4:00 and 6:00 pm and grilled right on the shore. The Corniche is the wide boulevard that runs along the Atlantic coast. It has sweeping views and is a popular place for locals and tourists to take a stroll. It’s also a popular place for locals to exercise at the large outdoor gym. If you like your food spicy and well-flavored, you will thoroughly enjoy Senegalese cuisine. Senegal’s most popular dishes are made with fish, lamb or chicken and usually include rice and vegetables. As a legacy of French rule, Senegal’s bakeries serve baguettes, croissants and other pastries that rival those in France. Thiebou Jenn (also spelled as Thieboudienne, Tiep Bou Dienn, and Ceebu Jenn) is Senegal’s national dish. There are white and red (tomato-based) versions made with fish, rice, and a variety of vegetables like carrots, eggplant, cabbage, okra, sweet potatoes and cassava. It’s often served with a bissap sauce. Thiebou Yapp is a variation of Thiebou Jenn made with seasoned lamb and rice. Yassa is a spicy, lemon chicken or fish dish with carmelized onions served over rice. Mafé is a stew of chicken, fish, or lamb simmered in peanut butter sauce with vegetables such as yuca, yams, potatoes, carrots, or turnips. Bissap is a juice made from hibiscus leaves. Gingembre is a tangy drink made out from ginger root and sugar. Bouye is a drink made from the fruit of baobab trees. The pulp is pounded into a frothy, opaque drink that tastes slightly like a banana smoothie. Ataaya is a sugary mint tea usually offered to friends and visitors. It’s served in three stages called the three concoctions. On weekends, Dakar has a vibrant nightlife that doesn’t get jumping until well after midnight and continues until 6:00 or 7:00 am. The strip of nightclubs on Route de Ngor in Les Almadies is a popular hotspot on Friday and Saturday nights. Thiossane, owned by Youssou N’Dour, a famous West African musician, is also a popular nightspot. He often performs at the club on Saturday nights when he is not on tour. The Bandia Reserve is a small private reserve with a variety of indigenous and non-indigenous wildlife, including woodland birds, green monkeys, patas monkeys, warthogs, white rhinoceros, giraffe, kudu, eland and impala. Saly is often called Senegal’s answer to the French Riviera and in fact is a popular destination for French and European tourists. The beachside town is the center of tourism in the Petite Côte and home to many hotels, nightclubs, bars, restaurants, shops and a casino. Somone is more of a low-key retreat, less glitzy and more chilled than nearby Saly. Somone’s best-known landmark, the Somone Lagoon, is an area of natural beauty at the mouth of the Atlantic ocean. A boat tour (costing 15,000 CFA) showcases a birdlife reserve and the mangrove ecosystem. Great post, I’m hoping to visit next year! How did you dress during your stay? I mostly wore pants, tshirts and long sundresses. It’s a majority Muslim country so women tend to dress conservatively. It’s rare to see people in shorts and tank tops. I have a group of people looking to travel to the West Coast in December. Would you say that this trip would be suitable for first time international travelers? Senegal is a beautiful country and it should be fine for first time international travelers with proper advance planning and support. If no one in the group speaks French or Wolof, make sure you have a guide or local contact who can provide translation. Enjoy! Great post. Did you plan excursions in advance or once you got there? Do the hotels offer tours?